Majority of Malaysian analysts are optimistic that KLCI could hit 1,700 while the Dow Jones have been receding from its high of 14,000++. A decoupling effect taking shape? 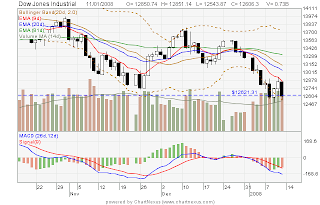 It used to be when Dow Jones fell, KLCI will surely fell in tandem the next day. The start of 2008 proved that this relationship does not mean 100% true anymore for the KLCI. 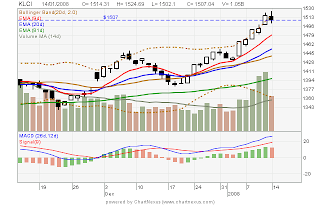 With the expected "upcoming" general election, surge in oil & CPO prices & Chinese New Year festive mood already priced into the KLCI's historical high of 1524, what else could propelled our beloved index to greater heights? An articled posted on yahoo finance today pointed out another potential market catalyst that was not highlighted before in any analyst's research reports have surfaced. Will this affect investor's sentiment and becomes another feel good reason to push up the KLCI? Only time will tell as this piece of news have not yet been confirmed from our side. For Bolehland, anything is possible!!! KUALA LUMPUR, Malaysia (AP) -- The United States and Malaysia resumed formal talks Monday for a free trade agreement, nearly a year after discussions stalled amid differences over Malaysia's government procurement policy. The United States -- Malaysia's biggest trading partner -- is seeking "real, demonstrable progress" in its sixth round of free trade negotiations with the Southeast Asian country, said U.S. Embassy spokeswoman Kathryn Taylor. "There is no deadline, but there is no indefinite timeline either. (Sounds very familiar?!) We need to be making progress. So that's what we'll be looking for," Taylor said. "Political calendars can affect the way trade negotiations continue." Taylor said the U.S. wants to seal a deal by summer before a new administration takes over -- a target that Washington believes is "achievable." Formal talks, last held in February 2007, stalled when the Malaysian government said it needed more time to consider its domestic interests. However, informal discussions aimed at ironing out differences have been held since then, leading to the latest talks in Malaysia, which are expected to end Thursday, Taylor said. "We're at the point now where both sides are ready to come back to the formal negotiating table," she said. "They are ready to come down and formalize what they've been discussing." Malaysian trade officials were not immediately available to comment. One of the most sensitive issues is Malaysia's affirmative action policy, which awards government tenders to ethnic Malay-owned firms. The program is meant to give the traditionally underprivileged Malay majority an advantage in competing with the wealthier Chinese minority. The U.S. wants more clarity and transparency in the bidding process for state contracts. Other sticking points have been differences over liberalizing Malaysia's services sector and highly protected auto industry, its ban on majority foreign ownership of banks, protection of intellectual property rights and labor and environmental issues. If the trade pact is signed, officials say bilateral trade between Malaysia and the United States would double by 2010 from $44 billion in 2005. But some Malaysian activists have opposed an agreement, saying it would put local farmers out of work, lead to job losses, erode workers' rights and end the availability of cheap generic drugs for those with AIDS and other diseases. This is my first time blogging. I want this blog to serve as a diary/journal to record down all the interesting financial stuff that i learnt over the years.